Steven D. Sparks, 72, of Spring, Tx passed away Thursday morning, June 8th, 2017. At the time of death he was residing at Vitas Healthcare Inpatient Hospice in Shenandoah, Tx. Steve was born on January 26, 1945 in New York City to Charles and Jean Sparks. He later moved to Metairie, LA and then finished High School in Connecticut. He attended college in Defiance, OH before transferring to the University of Houston. He served in the United States Army from 1968 to 1971, including tours in Thailand and Saigon. He attained the rank of Specialist Six and, after receiving the Meritorious Service Medal, finished out his tour of duty in Hawaii. He held positions at Leopold, Price, and Rolle, Browning Ferris Industries, and retired from CBRE in 2015. 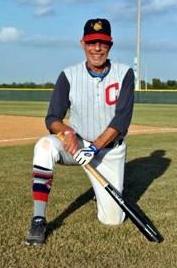 He was a proud member of the Men’s Senior Baseball League since 1992 and played until November of 2016. He is survived by his wife Kaye Sparks, his children Mark Hayes and his wife Ashley, Kandice Kaye, and Justin Sparks and his wife Christine, his grandchildren Kennedy and Haley Hayes, Jakob Guerrero, and Hunter Sparks, first wife Gail Hood, his brother Paul Sparks and his wife Linda and their children Frank and Kim Sparks, and his cat Norma Jean. He is preceded in death by his parents Charles Paul Sparks and Thedis Jean Sparks. Donations may be given to Vitas Healthcare or Cancers of America in his name. To read Steve’s complete story from May 9th click on his locker room picture above.